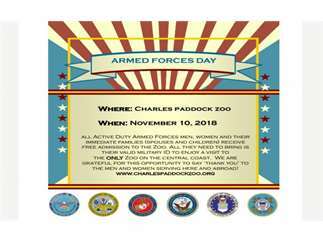 November 10th, 10-4 pm - All Active Duty Armed Forces men, women and their immediate families (spouses and children) receive free admission to the Zoo. Bring your valid military ID to enjoy a visit to the only Zoo on the central coast. We are grateful for this opportunity to say ‘THANK YOU’ to the men and women serving here and abroad!